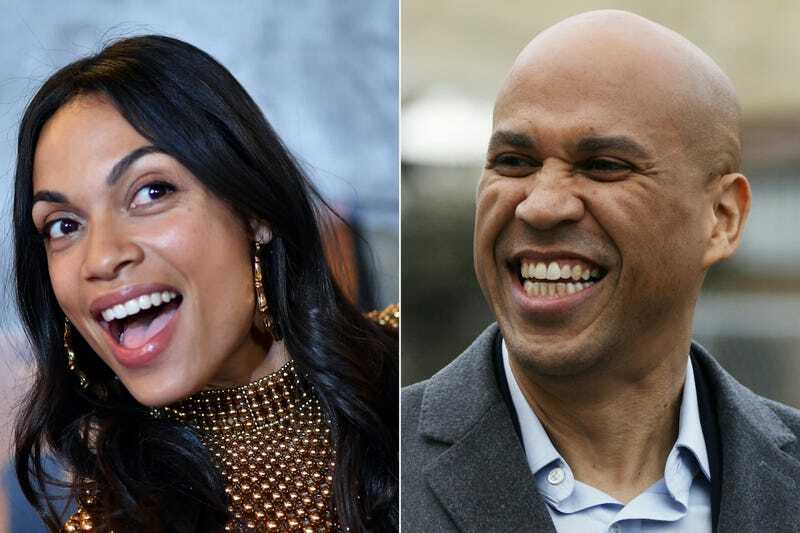 Last month, senator and presidential hopeful Cory Booker teased the possibility of meeting actress Rosario Dawson at the White House altar in her white dress (or whatever coloring of dress she chooses). Now he’s doubling down on his declarations of love for Ms. Dawson, telling a New York morning show that the couple is looking at a forever-ever timeline. Of course, there are haters in the world who think the timing of all this is a bit too convenient. The pair started appearing together in public in December, right around the time all 316 potential Democratic presidential candidates began launching exploratory committees and contacting Wall Street to gauge their fundraising capabilities. Booker says he met Dawson, who stumped for Bernie Sanders in 2016, at a fundraiser for former NAACP chairman Ben Jealous. Now, cynics will mewl that bachelorhood is a handicap Booker is surely aware of. If elected president, Booker would be the second black man to command the office, and only the third bachelor (the last one was Grover Cleveland, elected in 1886, who ended up marrying his boo thing while in office). Who trusts the single agenda? Not Americans voting for president, apparently. That’s sweet. Maybe T-Bone will be best man?